More a mentor than a teacher. Clare was playing with Lego on the bench. Rose came along carefully watching the construction in progress. Clare explained to Rose her complex building theory, "If you don't do it this way, it will kersplode." Rose nodded wisely as Clare's construction promptly fell apart or "Kersploded". Then Clare calmly recommenced building under Rose's careful gaze. Arggh. 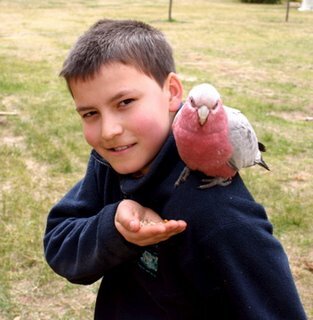 An Aussie pirate has a gallah! This Pink and Grey Gallah flew in to partake of our banquet of sunflower seeds. We reckon he must be an escaped tame bird as he is extremely friendly and not at all afraid of people. Here is Eric showing what all well equipped Australian Pirates are wearing. None of these common parrots. He's going for a gallah. On Sunday Rose joined Ariel who was reading in the spare room. After a short time "helping" Ariel, Rose decided to leave. 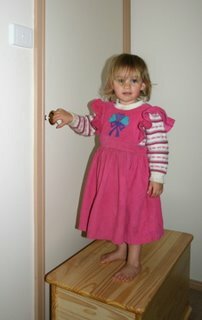 Although the door handle was too high for her, Rose pushed across the toy box and reached the handle. There was only one problem. The door opened inwards. In this photo she is looking as if to say, "Don't just stand there. Help me out!" I called a nearby hotel and asked: "Do you have internet?" "Yes. If you have your own computer and modem." the lady happily replied. "Modem? Do you mean wireless?" "No. You use the phone connection in the room." she explained. "So, then the answer is No. You don't have Internet. You just have a telephone port." "Is there a difference?" she asked. So, I didn't change hotels after all. This means that I am getting a backlog of interesting things to post which involve photos which aren't worth uploading via dial-up. The interesting thing is my dial-up speed. Last year - just before I connected to ADSL/Broadband, the dialup speed was around 41 to 44 Kbps. Now it is 31.2 Kbps. Is this because Broadband services are now available and the difference between dialup and broadband is so much greater when dialup becomes slower? Adrian Rice was six days late returning his book. He expected a late fine, but $22,840 was a little more than he expected! After being told not to worry he went home. A little later he received notice that the fine had to be resolved or it would be sent to a collection agency. Apparently it has finally been resolved, but I bet he is now much more careful borrowing books and returning them late. 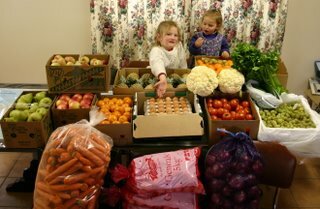 In past years we often visited the fresh food markets in Sydney. Today we returned after a 3 year absence as we had the desire for fresh food! We have a technique for getting great prices. The greengrocer and fruit retailers finish their purchasing by around 6:00am to 7:00am and the general public doesn't generally arrive in force until after 9:00am. So we aim to arrive in the quieter middle stretch. Considering the drive is around 1.5hrs this means waking up around 5:30am! 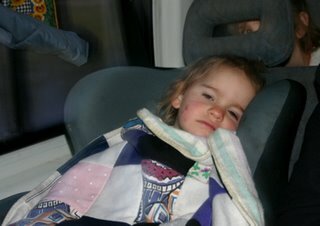 Here is Rose wrapped in a blanket in her chair not fully aware of what is happening. The temperature was -1C (30F) and still dark. The van's airconditioning could be described as co-operational. It waits for you to be warmed up before it starts blowing hot air. 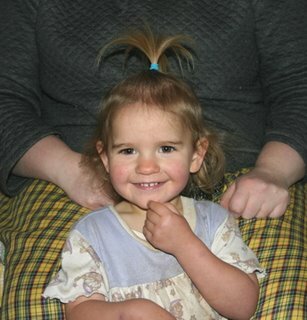 Surprisingly, very little has changed. Many of the sellers we used to frequent were still in their same positions, remembered us with a smile, and gave us fine deals. We purchased apples, pears, pineapples, mandarins, oranges, eggs, cauliflowers, celery, mushroooms, grapes, zucchinis, potatoes, onions and carrots. The one fruit we didn't buy which we sorely miss is Bananas. Since the cyclone (hurricane) destroyed the bulk of Australia's banana crops earlier this year, bananas have been selling for anywhere from $12 to $18 a kilogram ($4.10 to $6.15 US a pound). We are looking forward to the summer when prices should return closer to normal. Cajun Cay from Cajun Cottage under the Oaks has tagged me in a Book Meme. A blog "meme" is where one blogger answers a set of questions and then "tags" another blogger with the same questions. It's a bit like "Tag - you're it!" or a chain letter. Normally we aren't part of these things but the questions got me thinking. As we are into lots of books and I don't just read one book at any one time, my answers aren't necessarily short. After all, you need one book for the bedside table, another for the "throne" room, one for listening in the car, another whilst doing cross stitch, another when I am at the hotel and so on. Many books have made a great impact, but one that made a huge change to the direction of our lives was Why Johnny Can't Read by Rudolf Flesch. It tells the story of phonics, how we read and even includes a phonics program at the end of the book. I tend to remember everything I read pretty well, so don't often go back and re-read books. I do re-listen to lots of audio books with the children. I very much enjoyed re-reading CS Lewis's science fiction trilogy that begins with Out of the Silent Planet. I last read that when I was 16, so it was very interesting to read it at this stage of life. We have re-listened to "Have Spacesuit will Travel" and "The Rolling Stones" by Robert Heinlein a number of times. Probably a Reader's Digest book "How to escape from a Desert Island", or the "Dummy's guide to surviving a Desert Island". Failing that, the Douay-Rheims Bible by Fr Geo. Leo Haydock. There are so many notations from Christian fathers and doctors of the Church I would need the time on a desert island to get through them all. Red Dwarf by Grant Naylor. The Book of Acts always has me laughing, especially when St Peter is left standing at the door of his friend's house when the girl rushes off inside. Also, the children have enjoyed laughing while reading "Hunter Planet" - now out of print. Is this just for girls? I don't read crying books. Indeed! The one I'm currently writing for the children - The Zorro Family. Ariel reckons her Maths book shouldn't have, but other than that we don't read books that shouldn't have been written. I have such a backlog, I haven't time to plan beyond the current ones. 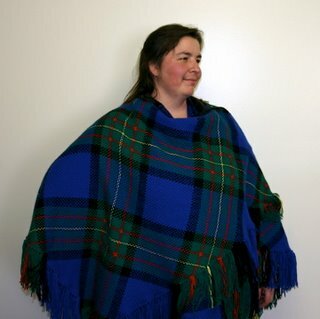 Lana has finally completed the Triloom Tartan Ruana. After finishing the first half (as seen here), she then began the second half on top of the first. Then the edges of both were strengthened and they were joined half way along the longest edges. It took quite some time to complete, but Lana was determined to just finish the thing now that it had been started. I think it worked quite well, don't you? When we lived in Georgia, we were impressed with the bright green of Spring and the yellows, oranges and reds of Autumn (Fall). In Australia late Winter makes us think of yellow. Wattle trees have a wide variety of different style blossoms, but they are all bright yellow. The median strip on the Hume Highway blooms with yellow around this time of year. 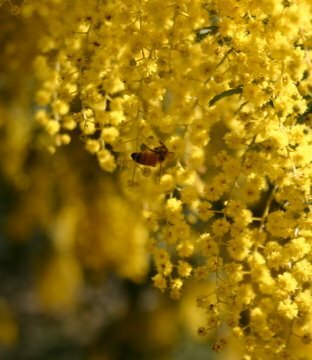 This photo is of the neighbour's Wattle tree which is full of bright yellow blossoms, and loudly humming with the buzzing of hundreds of bees happily zipping around their yellow pollen playground. It was a great opportunity to try out the camera and share another part of Australian fauna. Now that the shortest day is past and the days are getting longer, the flora is starting to come out with late Winter colours. Our daffodils are growing, tulips are popping up and some plants are even poking out tentative buds. Even though evenings temperatures are still dropping to around -1 to 0 Celsius (about 30-32F) you can feel warmer times are on the way. 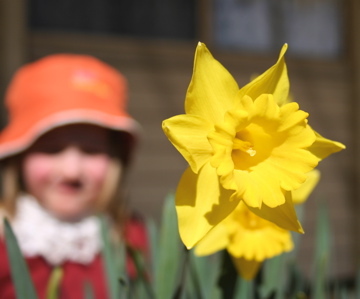 Here is one of our first daffodils with Clare looking on in the background. The latest travel and baggage restrictions are going to make a huge impact on business travel. The laptop PC is now an indispensible part of every business traveller's equipment. Keeping in touch via email and being able to provide assistance by bringing your office with you wherever you are has opened up the possibilities enormously. 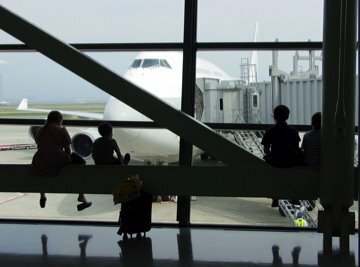 However the new restrictions regarding on-board luggage will make any business travellers consider carefully the risk and benefits of any international travel. (Here is the list of restrictions from United Airline's website) Also, you are expected to be at the airport 3 hours before the flight - domestic and international. This may make it more efficient to drive for shorter flights. Yesterday I was commenting to Lana that I wouldn't trust my laptop in the hold. The risk of damage or misplacement would be too great. Sadly, in an eerie case of premonition, I had a call tonight from a business friend whose luggage had been lost tonight. His laptop, electronic organiser, mobile phone and diary are all missing! Aargh! His office is now not with him and his business plans are thrown into chaos. I expect teleconferencing, video linkups, Skype and Internet based communication to really make a huge impact now the demand will be so much greater. 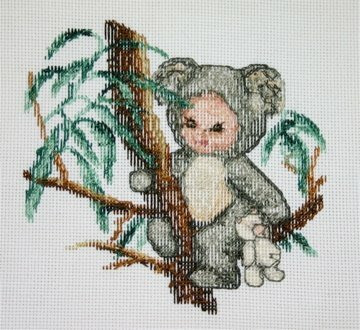 Friends of ours have asked Lana the best way of finishing off the ends of threads in Cross stitch. 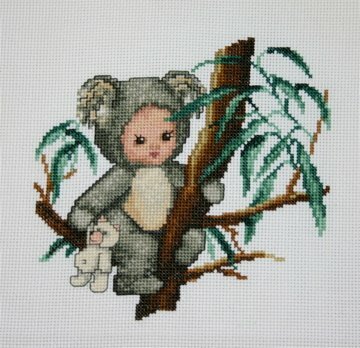 Kathleen Dyer has a great tutorial for cross stitching at http://users.rcn.com/ kdyer.dnai/ nf_xstitch_tut.html. The lesson on "How to end the thread" is here. This is one of EMS's baby animals we are showing as an example of the front and back of a picture. Basically, to finish a thread at the back, you thread under about four to five stitches and then trim the tail close. Never, ever knot the thread. That's knot on - either at the start or end of the thread! Lana has done a coollection of these baby animals, some of which have made it into a quilt. You can see the whole range at the EMS site. Rose tends to exaggerate her feelings. Everything is either one extreme or another. Today I caught her getting her hair brushed, cleaning out all the rubbish that collects there within a day of two year old adventures. 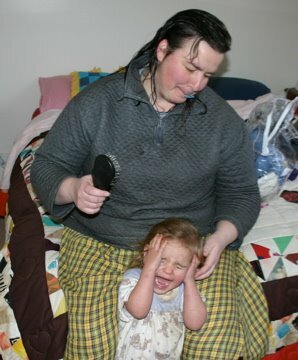 Compare the face she is making and the fact that the brush is nowhere near her hair. About 30 seconds later, with her hair in a fountain, she is once more all smiles. Last night was Census Night. 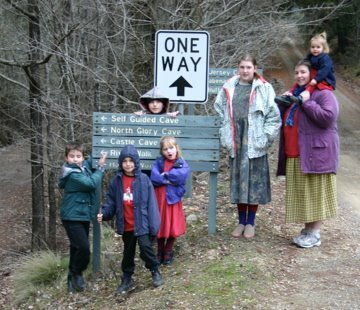 Every five years the Australian Bureau of Statistics organises a national census. Traditionally this has been a very large form asking lots of details. Although it is a well designed form, with a family of eight it is tedious to complete. This year they went high tech and set up the ability for people to enter the census online. Woohoo! Over 1 million people took advantage of this and I filled out our data this morning. It was much easier. So now we count. At least in the ABS's eyes anyway. - the hotel cost would be easily covered by doing extra client work at night. So all the financial reasons were winners. The non financial reasons have proven more compelling. Although I am able to chat with Lana and the children remotely, it's not the same as being in the physical presence of my family. It is not just children that spell Love T-I-M-E. At the end of the day love is the desire to spend time with the object of our love. It's all part of that Know - Love - Serve thing. So I am spending this week at home (at nights). The travel time is utilised listening to audio books - currently Pickwick Papers by Charles Dickens. I may spend future weeks away, but not for such a long stretch. As I tell Lana, I travel 1,000 miles for one of her smiles, and that is about how many extra miles I will travel this week! Being with the family - Priceless! Rain. Rain. Rain. 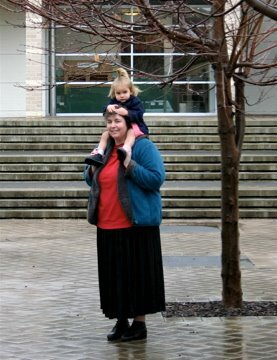 We had to go out today to stock up the pantry (and get out of the house), visit the library and return some movies. Now go brighten our day and vote for Bruggie Tales as a Blog of Summer. A scorpion in the shower! When Lana went into the shower, there were no bugs. As she stepped out there was a drowned scorpion on the floor. A scorpion! 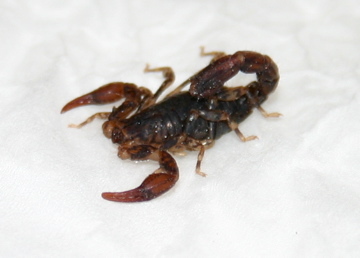 What's a scorpion doing here, in the middle of winter, with bucketloads of rain outside, in the shower? It's not a big scorpion, less than the size of a 5 cent piece/penny. But it's the first one we've ever seen - so therefore it's the biggest one! Bruggie Tales has been nominated in one of a series of polls for interesting "Blogs of Summer". Make sure you go to here to vote for Bruggie Tales, if only to show you appreciation of the irony of a blog talking about an Australian Winter nominated as an interesting Summer Blog. The Poll is shown on the left hand side bar, a little further down the page. 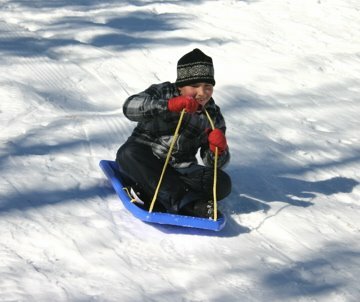 And here is a photo of James enjoying a toboggan when we went to the snow. Whilst I was away in the city I took the opportunity to visit stores which are not near our home. Lana had a list of "necessary" items - wool, sewing bits and so on. Whilst I was at the store I found a box of 100 bikkie (cookie) shape cutters. 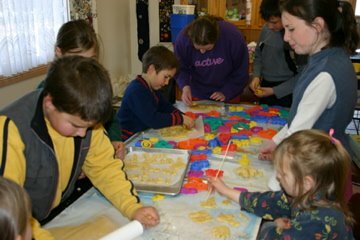 This made me a minor hero when I returned home and here is a photo of our children and friends all making a variety of different shaped sugar cookies. Naturally everyone knows these simple biscuits taste better when they are the right shape. Clare is making the biscuits extra tasty by drawing patterns on them with a wooden skewer. There is something about the plain speaking nature of Australia that sparks a smile. This sign is advertising quite inexpensive saw chain. But I suspect that "Quite inexpensive Saw Chain" wouldn't have the same impact. I am sure they meant "Bloody" in the Australian descriptive sense and not the literal, "Oops, this saw chain is sharp" sense.